BJP chief Amit Shah, has been fielded from Gandhinagar seat, by replacing veteran leader LK Advani. 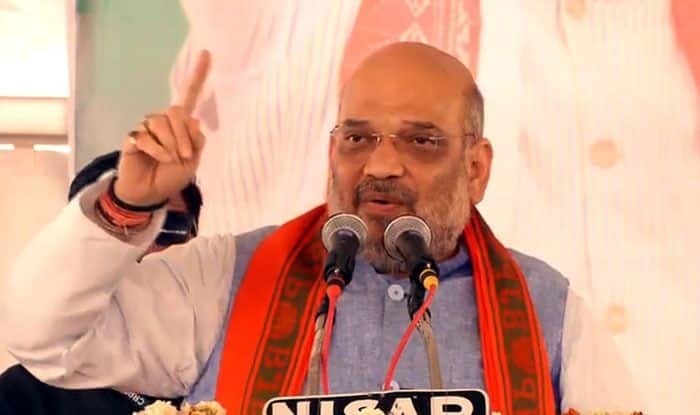 Shah is contesting the Lok Sabha polls for the first time. Lok Sabha elections 2019: The Gandhinagar constituency, is one of 26 Lok Sabha constituencies in the western state of Gujarat and it will go to polls on April 23. It covers seven assembly segments – Gandhinagar Uttar, Kalol, Sanand, Ghatlodiya, Vejalpur, Naranpura and Sabarmati. This year, Bharatiya Janata Party (BJP) president Amit Shah, has been fielded from this seat, by replacing L K Advani. Shah is contesting the Lok Sabha polls for the first time. In the 2014 Lok Sabha election, veteran leader Advani became victorious by winning with a huge margin of over 4.80 lakh votes. Advani has won five consecutive elections from the Gandhinagar constituency since 1998. He had defeated Kiritbhai Ishvarbhai Patel of the Congress. Congress’ Gitaben Patel, BJP’s Patel Hasmukhbhai Somabhai and Vaghela Ganeshbhai Narsinhbhai of Bahujan Samaj Party (BSP) are a few prominent candidates contesting for the upcoming general elections from Ahmedabad East Lok Sabha constituency of Gujarat. This constituency was created in 2008 and covers seven assembly segments – Dahegam, Gandhinagar Dakshin, Vatva, Nikol, Naroda, Thakkarbapa Nagar and Bapunagar. The Ahmedabad West Lok Sabha constituency is currently held by Kirit Premjibhai Solanki of the BJP. Kirit Premjibhai Solanki won the 2014 Lok Sabha election against Congress’ Ishwar Makwana from this seat which is reserved for Scheduled Caste candidates. Next is the Surendranagar constituency which covers seven assembly segments, namely, Viramgam, Dhandhuka, Dasada which is reserved for members of Scheduled Castes, Limdi, Wadhwan, Chotila and Dhangadhra. In the 2014 Lok Sabha election, Devajibhai Fatepara, of BJP defeated Somabhai Gandalal Koli Patel of Congress by a margin of 2 lakh votes. The Rajkot Lok Sabha constituency will also cast its ballot on April 23. Kagathara Lalitbhai of Congress, Kundaria Mohanbhai Kalyanjibhai of Bharatiya Janata Party and Vijay Parmar of Bahujan Samaj Party are a few prominent candidates contesting for upcoming polls from Rajkot Lok Sabha constituency of Gujarat. The Rajkot constituency covers seven assembly segments – Tankara, Wankaner, Rajkot Purva, Rajkot West, Rajkot Dakshin, Rajkot Gramya and Jasdan.